If you are searching for a top-level sailing performance with elegance, Semiramis is the ideal yacht. Blending high performance, stable cruising and comfort living on board, Semiramis can be the perfect yacht for people who want to enjoy sailing while being on holidays. Her hull design offers really high speeds when sailing. 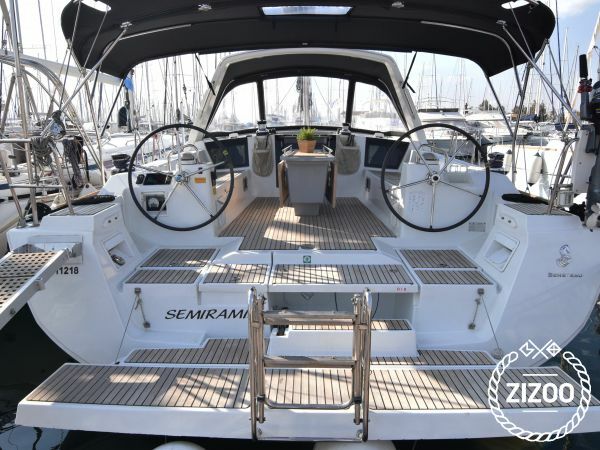 Her full batten main sail is upgraded with a fast track system and the electric winch for the sails offers you the ultimate sailing experience. It’s not only the performance that is a key feature of this yachts but also the perfectly designed internal layout that can accommodate 8 people in her 4 double cabins. Semiramis is also easy to maneuver in ports because is equipped with a powerful bow-thruster. After a beautiful sailing day, enjoy the sunset in the big cockpit or relax in the swimming platform at the aft of the yacht.